KNES 001A (formerly P.E. 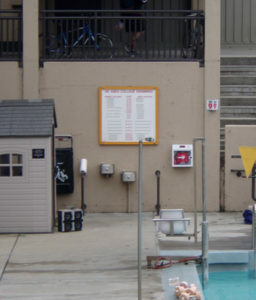 26A) is the Novice swimming class at De Anza. Novice Swim FAQs has the cost, etc. This page is used for messages (see below) to my KNES 001A students during quarters the class is in session. Spring 2019 swim classes are started and it is too late to add. Summer 2019 I will teach a novice swim class five Saturdays, July 6, July 13, July 20, July 27 and August 3, 10 am – 2:30 p.m.
We will be in the pool the first class (Saturday, July 6), so bring your swimsuit, towel, sunscreen, (optional) swim cap. If you read about it too late to add, please at least be enrolled at De Anza before the first class so you can add if we find we have the space. 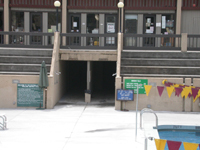 To get from the pool deck to the locker rooms, women enter the tunnel on the RIGHT from the pool deck and go directly up to their locker room. Men enter through the LEFT entrance and go down a hall to their locker room. Men should note that there is a storage room in the left tunnel that is accessed by both female and male personnel, and they should change clothes in the locker room, not the tunnel. At the exterior pool end of the tunnel there are showers on the wall, especially good when the locker-rooms are closed. Want to buy a rashguard or spring (short sleeve, short leg) wetsuit or a wetsuit vest, for extra sun protection, modesty or warmth? And, the classroom we will be using at the start of many classes (to watch Red Cross / USA Swimming how-to-do it videos) will be PE12U. To get to it from the pool deck, you would go through the doors/gates between PE buildings PE1 and PE2, turn left and look for a door in the building on your left with stairs up to PE12U. Many people wear a long sleeved rashguard top and jammers (men’s longer legged swim suit) for extra sun protection. Ladies wear them for more coverage over their regular swim suit. Some buy a spring (short sleeve, short leg) wetsuit for warmth. Homework … in a swim class?? 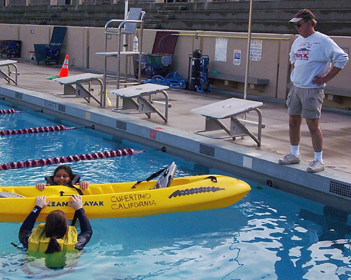 All swim classes at De Anza share the same curriculum, (the course content, designed by De Anza College). Each instructor must teach the same of skills and knowledge about swimming, but each instructor can go about reaching these goals in various ways. You do not need to buy a textbook for any class I teach. (The text costs $128.60 at the bookstore as of winter 2017.) There are some copies of the text for this class on reserve in the Learning Center. Students can share a book. If you have already purchased any version of the series, or choose to buy an older version, any version will work for this class. We will talk about this in detail the first day of class, so please put off buying the text until after the first class session. Examine the global and historical development of swimming from survival to competition. 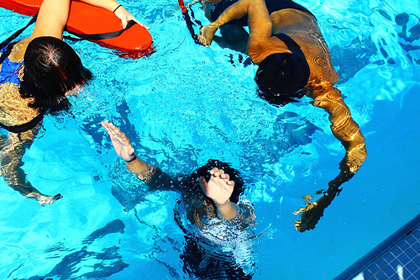 Experiment with the laws of physics as they apply to basic swimming skills. Apply basic exercise physiology and nutrition to swimming. Analyze causes of drowning and apply safe water practices. Examine body position as it relates to individual stroke components. Combine stroke components into whole swim strokes. Demonstrate the ability to perform one major swim stroke for a distance of 25 yards. 1. Assigned readings from the text book ‘Fit and Well” by Thomas Fahey et al. 1.Essay on one of the five components of fitness based on the textbook “Fit and Well” by Fahey et al. These areas would require hours of lecture to cover them as required. In an effort to be able to spend more time in the water I have developed some short online reading assignments to cover most of them. Those that cover the De Anza requirements are required for a passing grade; do more and you can earn a higher grade. Relax, these are short assignments. Often the easiest way to do an assignment is to run your mouse across some of the text, copy it (click Ctrl C or Apple C on many computers) and paste it (click Ctrl V or Apple V) to a blank document on your computer. You can handwrite any assignment but it must be easily readable, so block printing is preferred and must be in letters at least as big as the type on this page. If you use a printer, or write with a pen, use black or dark blue ink. Please note: you are responsible for keeping a copy of each assignment in case the one you turn in is lost. No homework assignments will be turned in online. I do not accept early or emailed assignments. Spring quarter all homework must be in my possession, (not in a mailbox, etc.) by 1:50 p.m. June 22, 2019. The De Anza Library has free access for current students to the New York Times. Go to the library home page: http://www.deanza.edu/library/ and click on, The New York Times. At the next screen, log in with your Portal IDs. On the next screen, create an account. The first day of class, Saturday, April 13, 2019 De Anza Auto tech will be holding their Sixth Annual Car Show in parking lot E (behind the pool area) at 9:00 AM – 1:00 PM. It MIGHT impact parking, so you would want to park in Lot C, see the large white rectangle labeled “Stelling Parking Structure” at this map. Read the swim class safety rules webpage and briefly write up three new safety rules you find. If you already knew all of them, write up the three most important to you. To avoid confusion in recording your homework put your name at the top of the page, and the title safety rules. Note that I said briefly write up; these assignments do not require paragraphs and paragraphs of verbose prose. After class, start your personal practice journal. 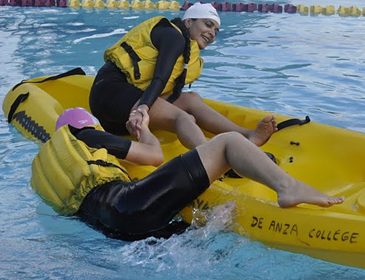 Each swim class at De Anza includes curriculum about hydrodynamics, some of which we usually discuss the first day of class. “A. Experiment with the laws of physics as they apply to basic (or beginning, intermediate or advanced) swim skills. We review the above mostly by applying the theories to swim skills, thinking about why, for example, when people swim underwater with straight arm pulls it is not as effective as with a bent arm pull. Each class usually tries an experiment with floating (or not floating so well) and discusses why some people float horizontally, some diagonally, and some vertically. Most classes do at least one experiment with the laws of physics. are the chapter on Hydrodynamics, with details about the laws of physics and swimming. Rather than taking time to cover all of it in class (and certainly not trying in the pool all the experiments / activities in the text), you can feel free to read more. There is not any written homework for this reading. Conference rooms A and B are upstairs in the Campus Center. Read Water safety and briefly write up four new things you learned. If you already knew everything at that page, write up the four most important things mentioned. To avoid confusion in recording your homework put your name at the top of the page, and the title water safety. Start reading chapters 1, 2, 3 (cardiorespiratory endurance), (4 muscular strength, muscular endurance), 5 (flexibility), 6 (body composition) and 7 (putting together a fitness program) in Fit and Well. At the end of the quarter you will need to turn in a 250 word Essay on one of the five components of fitness This link describes the essay and gives you sources of info on your choice of either cardiorespiratory endurance, muscular strength, muscular endurance, flexibility, OR body composition. The Outdoor Club Monterey ocean kayak day trip will happen again 8 a.m. Sunday May 12, 2019 (or if weather cancels that day, which is rare) 8 a.m. Sunday, May 19, 2019. Paperwork is ready for people to sign up for the May Monterey kayak trip. It will make signing up faster if you have read the details about the trip AND the trip agreement in advance, (and you will be more likely to pass the required pre-trip quiz). If you are in the 10 a.m. class you can stay after class to sign up, or if you are in the noon class you can come early. Often people can sign up during my office hour if it is held after the noon swim class. You can find the Club at classroom S56 Fridays, April 19, 26, and May 3 1:30 to 3:30 p.m. A first aid class will be in session but you can sit in the back and get questions answered or sign up for the kayak trip. We will also do signups on Club Day, Thursday, April 25 from 7 a.m. to 1 p.m. at a table in the main quad, probably in front of the Learning Center. If it looks like rain the official Club Day gets cancelled, and moved to May 2. Read the Swimming vocabulary webpage and briefly write up three new things you learned. If you already knew everything at that page, write up the three most important to you. To avoid confusion in recording your homework put your name at the top of the page, and the title swimming vocabulary. Each first Saturday of the month (including May 4)there is a flea market at De Anza, (unless it is totally rained out), taking up a lot of parking space. There will be parking attendants asking for ten dollars to park, but if you have purchased a quarter-long permit and tell them you are there for a swim class, they should let you in without paying extra. DO NOT try to park in the lot on the east (Stelling road) side of the campus, there is almost always much more room, and less hassle if you park in lot E, on the other side of the PE quad. Find Lot E at: http://www.deanza.edu/maps-and-tours/documents/campusmap_20180413.pdf OR try the Flint Center parking garage, at the Stevens Creek and highway 85 corner of the campus, as even the top floor has space most Flea Market days. You will need to plan time for the walk from there, but that could be faster than driving around and around looking for a parking space. De Anza College will host the CCCAA State Swim And Dive Championships on Thursday May 2 – Saturday, May 4, 2019 so both classes will meet in a classroom PE 12U on Saturday May 4. Read History of swimming section webpage through to History of aquatics not yet in the curriculum and briefly write up three new things you learned. If you already knew everything at that page, write up the three most important to you. To avoid confusion in recording your homework put your name at the top of the page, and the title History of swimming. Read: How to rescue a drowning victim using a reaching assist or a shepherd’s crook and write up three new things you learned from the page. If you already knew everything at that page, write up the three most important things mentioned. To avoid confusion in recording your homework put your name at the top of the page, and the title shepherd’s crook. Please note there are two writing assignments on the history of swimming, the short one due today and the 250 word swim class short essay due later in the quarter. The answer to the question: How much of this homework do I have to do to get the grade I want? is at the course syllabus , which has the grading standards. Read it and write up three new things you learned. If you already knew everything at that site, write up the three most important things mentioned. To avoid confusion in recording your homework put your name at the top of the page, and the title skin cancer. and briefly write up two most important rules for you. choose two topics and briefly write up two new things you learned at each of the two topics. If you did not learn anything new, write up the two most important things at each of the two topics. To avoid confusion in recording your homework put your name at the top of the page, and the title Nutrition. Now could be a good time to start on the swim class short essay required by De Anza for all novice swimming classes. Optional: Can supplements help with colds? Optional: Sneak some more fruit juice into yourself or kids: Pour several different colored 100% juices into ice cube trays and freeze. When frozen, put an assortment of different colored fruit juice cubes into a glass and pour apple juice or white grape juice or sugar-free seltzer over the cubes. Optional: You can search the database by food item, food group, or manufacturer’s name to find the nutrient information for most food items. Photo below by lifeguard instructor George Cullison. Finish reading chapters 1, 2, 3 (cardiorespiratory endurance), (4 muscular strength, muscular endurance), 5 (flexibility), 6 (body composition) and 7 (putting together a fitness program) in Fit and Well. The last day to drop with a “W” (withdraw) is Friday, May 31 so people who want to do so should probably drop after class today, May 18. 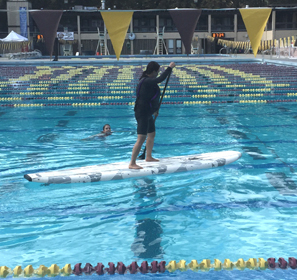 After May 31 it is impossible to drop quarter-length classes and people who have not been regularly attending might not have a way to catch up on attendance, especially since there are no weekday or evening swim classes with shallow water you can do makeups in. Ways to be able to repeat a class are at: repeatability. Each first Saturday of the month (including June 1) there is a flea market at De Anza, (unless it is totally rained out), taking up a lot of parking space. There will be parking attendants asking for ten dollars to park, but if you have purchased a quarter-long permit and tell them you are there for a swim class, they should let you in without paying extra. DO NOT try to park in the lot on the east (Stelling road) side of the campus, there is almost always much more room, and less hassle if you park in lot E, on the other side of the PE quad. Find Lot E at: http://www.deanza.edu/maps-and-tours/documents/campusmap_20180413.pdf OR try the Flint Center parking garage, at the Stevens Creek and highway 85 corner of the campus, as even the top floor has space most Flea Market days. You will need to plan time for the walk from there, but that could be faster than driving around and around looking for a parking space. I scheduled most homework to be completed before the end of the quarter so you can concentrate on your other finals and since so many people need transcripts, so I can get grades in on time. IF I accept any of the previous homework late, I would appreciate it being turned in by today. Complete the open book do-it-at-home swim class final exam to be posted here later. OOPs, if it’s been awhile since you read the text; Fit and Well text chapter notes could help you with the final. I scheduled most homework to be completed before the end of the quarter so you can concentrate on your other finals and since so many people need transcripts, so I can get grades in on time. IF I accept any homework late, I would appreciate it being turned in by June 8. No homework due Saturday, June 15. Saturday, June 22 last class, no homework due except the personal/practice journal you have been keeping all quarter. An outside group will be using the pool complex, so we will likely meet in 12U again, or . . . decision to be made closer to the date. Please note again, all homework must be in my possession, (not in a mailbox, etc.) by 1:50 p.m. June 22 and I do not accept emailed homework. 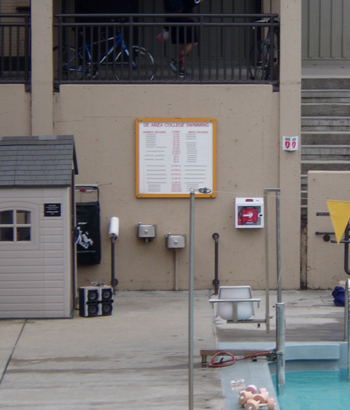 There is an Automated External Defibrillator (AED) in a white box on the wall at the south-east end of the swimming pool, the pool shallow end, where our swim class meets. 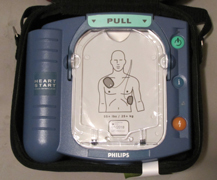 It could be used, by anyone trained in how to use it, to help someone who has a massive heart attack and their heart stops. Please note that when someone opens the door to the box on the wall a loud alarm goes off that does not stop when the door is shut. Various swim students have taken the class in anticipation of possibly becoming lifeguards. One swim student got the highest A+ in the HLTH57A class fall quarter 2018. There is a free download of the text available. 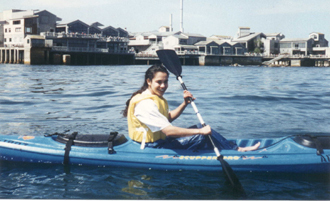 and participating in an Outdoor Club beginners Monterey kayak trip first will give you enough kayaking experience to volunteer. completed a 41-mile marathon swim, for 29 hours and 22 minutes, starting in Oxnard, swimming around Anacapa Island to Santa Cruz Island and then back to Oxnard on Sept. 21, 2018. “It was a swim no one had ever accomplished before and it was the second longest solo marathon swim in California Channel Islands history. . .
Amazingly, Mignosa only began attempting marathon swims in July of 2017 at the age of 53. “I’d be in [the pool] for an hour or two and I didn’t feel like it was enough,” said Mignosa. He laughs and says that the other downside was having to turn around too soon. Now Mignosa swims in the San Francisco Bay where he only has to turn around when he’s ready to. Marathon swimmers are not allowed to use a wetsuit in challenges because it adds buoyancy to the swimmer, so Mignosa doesn’t wear one while training. Ken “completed the California Triple Crown in 2017 which includes a swim across Lake Tahoe, a swim from Catalina Island to the Mainland, and a swim from the Mainland to Anacapa Island . . .
Ken told me that the English Channel swim can cost, with the required official crew in a boat nearby, as much as $10,000. On a weekend, Jan. 31 to Feb. 2, 2020, THIRTIETH ANNUAL Yosemite Valley Winter Camping trip. If you would like to do some reading about swimming strokes, or swimming in general, try American Red Cross Swimming and Water Safety. Its public libraries number is 797. 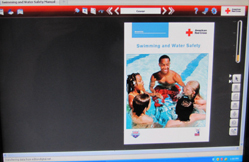 This is the text for the Red Cross swimming teacher certification Water Safety Instructor. 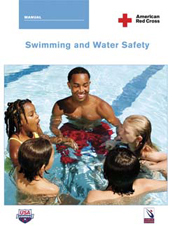 (The American Red Cross Swimming and Water Safety Manual had no index, so I wrote one: Swimming and Water Safety 2009 index). 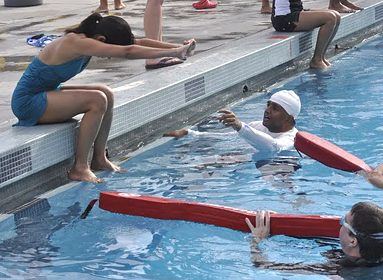 The Red Cross prerequisite swim tests are described at: Lifeguard Training FAQS That page has lots of how to pass the tests advice, including some of the standards expected by the Red Cross and is worth reading thoroughly if you are tempted to try a lifeguard class. De Anza College home games usually has the dates of the campus blood drives as well links to student recitals, dance performances and art exhibitions. De Anza College offers many scholarships, some of which have few applicants! The aim of this page is to provide swimmers, parents, child care providers and other swimming pool patrons with a few guidelines to help them determine if the lifeguards at the pool they go to are doing their jobs properly. Many of my students ask me if I can teach their children to swim. I recommend that if they have the time, all my swim students should also take KNES 50A/50L, and use the Lifetime Fitness and Wellness Center. you get the Highway Patrol at a central location. Sometimes, especially if you are not calling about something on the freeway/highway, it would be faster to get dispatch for the specific city the problem is happening in. This requires knowing the direct dial seven digit phone number for each dispatch. 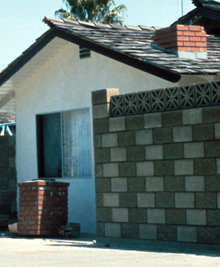 In Cupertino, the number to get help quicker is 299-2311. Direct dial emergency phone numbers for most cities in Santa Clara County, California, can be found at the Santa Clara County ARES/RACES (Amateur Radio Emergency Services/Radio Amateur Civil Emergency Services) website.